J. Brooks Joyner has spent his life getting others to open their eyes. From Calgary in Canada to Montgomery, Alabama and Omaha, Nebraska and Allentown, Pennsylvania, and many places in between Brooks has opened the eyes of countless people to the universe of art from every part of the globe. Now, as he enters a new chapter in a story book life, Brooks is opening those eyes to the challenges of ALS. This time, instead of showing the art work of others, he is sharing his own personal story. After a careerin the art world, Brooks is proud to showcase his knowledge and life. From the beginning of his career in the arts, J. Brooks Joyner has been on a mission to show the diverse beauty of the human imagination to people of all backgrounds. Even now, as his body becomes stiff as a result of ALS, Brooks finds new ways to expand his mind and his perspectives. He has learned the value of experiencing different views and ideas from a very young age, so he sees a value in letting others know about how ALS has affected his own life. Brooks is a 13th generation Joyner in America and his son is 14th generation. Their family traces back to Southhampton County, Virginia, across the river from Jamestown. His mother was Greek and explored various religions, encouraging her children to seek their own path. These days, Brooks’ three sisters, all in their 70’s, have done just that. His sister Virginia converted to Judaism, Cynthia is Catholic, and Diana married an Episcopalian. Instead of clashing, the Joyner family is closer than ever, embracing the richness of their diverse views and lives. That mentality, fostered from a young age, helped Brooks become a success in the art world. He graduated with a Bachelor’s Degree in History from University of Maryland. In his last year, two professors in the art department came to him and said “we went to give you a fellowship if you will switch to art history.” It was too good of an opportunity, so Brooks too up the offer and studied American art and Jackson Pollock on his way to getting his Masters Degree in Art History. Had those professors not offered him that chance and had he not been open to all of the possibilities and the work that it entailed, Brooks life would be dramatically different. The art world in so many cities would be very different as well, but that would not be so obvious right away. The influence on the art world would not be obvious because J. Brooks Joyner first had to take on some odd jobs along the way. He was married and attending graduate school at New York University, but with a new baby, he had to go to work. He quit NYU and a friend in Vietnam asked if he would occupy his farm in West Virginia. He even drove a grocery truck for a few years to make money. Through it all, Brooks was experience the real world outside of academia. His outlook would likely have been much different if life had been easier. Perhaps his views on the world would not be as interesting or as grounded. Thankfully, each step helped him become more successful in his career and more of an influence on others. One day, Brooks received notice of an opening at Towson State University in Maryland, where he became Director of the Art Gallery and a teacher. 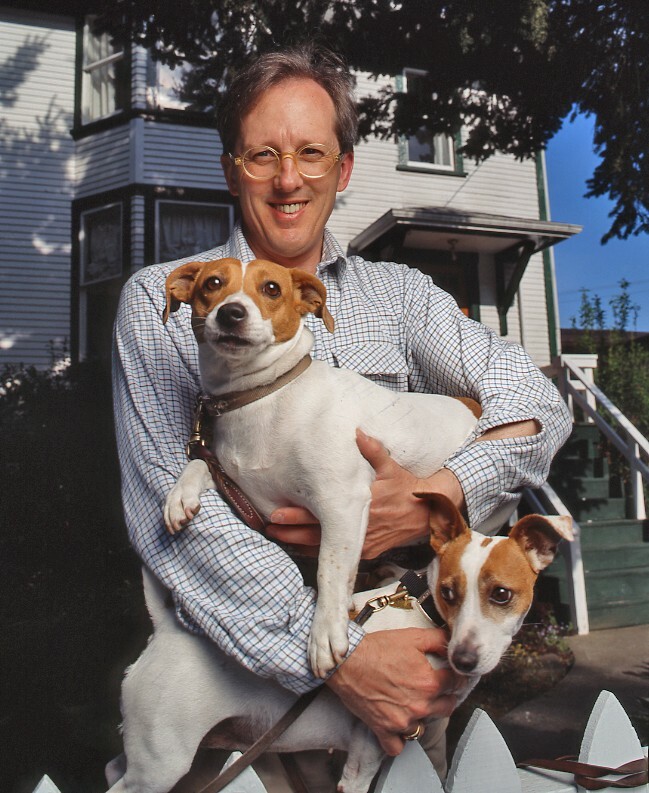 His work brought him many connections and attention and he moved on to become the Director of the Nickle Arts Museum in Calgary, Alberta, Canada. Now in Calgary, Brooks developed new skills beyond his initial immersion in art. He convinced major patrons to donate millions of dollars to the art collection and design, built a budget to make the museum an even bigger attraction, became a research historian, write weekly contributions for the Albertan newspaper, lectured at the University, and authored a book on distinguished Canadian painter Marion Nicoll. Just as Brooks was devoting his time to expanding the outlook of others, he was expanding his own professional talents and expertise. He was making a name for himself that would propel him to great heights, including a stop at the White House. His time in Calgary also led Brooks to meet his second wife, Louise, who continues to be his ally and champion today in his new battle with ALS. This journey still had many stops along the map, quite literally, as Brooks moved across the continent to enhance the art scene in many cities. He spent time as the Director at the South Bend Art Center in Indiana, where he worked with the local government to raise awareness of art, raised significant dollars for special exhibitions, drew national attention to the small museum by bringing in noteworthy sculpture installations, and expanded learning of art and art history into the community. Everywhere he went, Brooks made sure that people of all backgrounds saw that art was important and valuable and that they could be a part of it. That inclusive mentality next sent Brooks to Montgomery, Alabama and the Montgomery Museum of Fine Arts. There he oversaw the construction of a new museum complex, raised millions of dollars in new capitol, expanded the scope of membership in the community, created new events, and persuaded major benefactors to bring private collections to this city of roughly 200,000 people. Brooks had been to New York City and his view was that there was no reason that art should only be in the biggest cities. Everybody deserved to see the beauty of the entire world, and he had the mindset and talent to help bring it to them. Next Brooks and his wife went back to Canada, this time to the Vancouver Art Gallery. This time, he went from a city of 200,000 to a metropolitan area of almost 2.5 million people. In typical Brooks fashion, he used his role as director to expand sponsorship and membership in the diverse community to bring the world of art to every person who was willing to open their eyes to it. It was at his next stop as Director of the Gilcrease Museum in Tulsa, Oklahoma, where J. Brooks Joyner would receive his invitation to the White House. He raised the national profile of the museum through changing how it was governed and operated and then through bringing in renowned displays. His biggest achievement was mounting the Thomas Moran retrospective exhibit in partnership with the National Gallery of Art. This exhibit attracted approximately 125,000 visitors over a 14 week period and it brought J. Brooks Joyner to the White House and a visit with then First Lady Hillary Clinton in the Rose Garden to showcase the work. It was a moment that Brooks never would have dreamed of when the professors at Maryland suggested switching to Art History. It was also a moment that validated his belief that the beauty of art should be shared with every corner of civilization. This career of growing accomplishments led to Brooks Joyner becoming the Director of the esteemed Joslyn Art Museum in Omaha, Nebraska at the start of the new century, where he remained until 2009. In that eight year run, Brooks worked with benefactors to travel to Russia and Mexico to bring world renowned exhibits to Omaha and, in turn, exporting American Western art to those countries. The Joyner family got involved in all aspects of life in Omaha, raising money for the local St. Cecelia Cathedral Parish Centennial and taking in all of the local culture. Art never left his mind no matter where they went. When the family travelled to Madrid in Spain, Brooks turned a leisurely visit to a museum there into a chance to bring more European art back to the Joslyn. His infectious perspective on life, open to all outlooks, attracted more sponsors and donors, and helped make the museum fresh and exciting for its patrons. Brooks started his time at the Joslyn by inheriting a budget crisis. He left there having raised the endowment from $20 million to over $26 million and completing a fully funded $7.5 million project and opening of the Peter Kiewit Foundation Sculpture Garden in June of 2009. All along the way, Brooks was making art relevant and exciting for people of all ages and backgrounds. With the influence of his wife, Brooks become a devoted Catholic. He learned to love the mass and followed the evolution of art in the Church over the centuries, adding even more perspective to his artistic views. Brooks developed non-Hodgkins lymphoma while in Omaha, but that didn’t stop him. Nothing has or will. Instead of allowing the disease to hinder his curiosity and professional development, Brooks soldiered on in good spirit, joking that the double vision that he experienced just meant that the art was cubism. 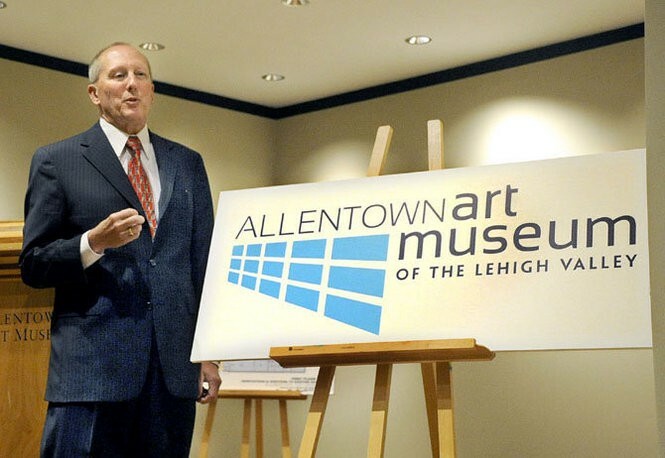 He was recruited to the Allentown Art Museum and arrived in 2010 to much acclaim. The board saw his accomplishments in Omaha and looked to him to oversee a multi-million dollar capital expansion and to do what he had done everywhere, and that is to bring the art world to the people. After coming to Allentown Art Museum, the Joyner family bought a small farm in the Lehigh Valley. Louise enjoys horse riding and they have a pool, which Brooks says he enjoys more because it brings his two children happiness when they have parties. His daughter Isabel is currently applying to colleges and his son Jonathan has already had his own impressive life, joining ROTC at the University of Alabama and training defense forces in Africa, including helping refugees escaping Boko Haram. Maybe Brooks perspective on seeing beauty and value in every part of life and the world has had an influence on his son helping those in need in Africa and beyond. It has surely made a similar influence on the outlook of so many others that he has touched. The most recent Director position that Brooks held was not in Allentown, but instead at the Nicolaysen Art Museum in Casper, Wyoming, where he worked from 2013 until the autumn of 2014. He arrived and brought his usual touch, working with government and the community to raise money and attention for art in the region. It was another point on an ever expanding map of influence. Today, J. Brooks Joyner is an independent art consultant and continues to be an author of magazine articles and books. 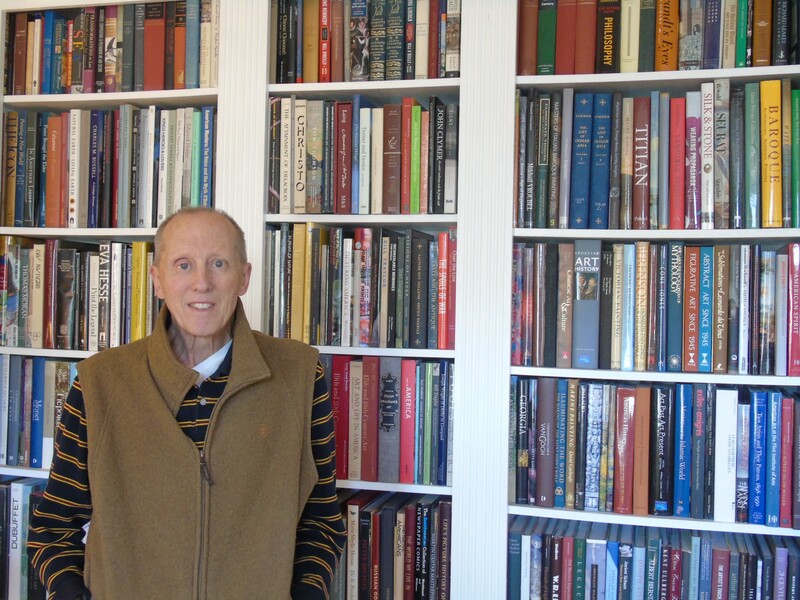 He is currently working on an article for Fine Art Connoisseur magazine on the western painter Harry Jackson. He is also currently dealing with the effects of ALS. In late 2015, Brooks complained to a family physician in Allentown of his hand not functioning properly. He took part in multiple tests and eventually a diagnosis of ALS was confirmed by Dr. Glenn Mackin at the Lehigh Valley Health Network. When the diagnosis came, Brooks was commuting weekly to another art job in New York City, which he quit in 2015 when he began having speech issues and travel became a greater challenge. 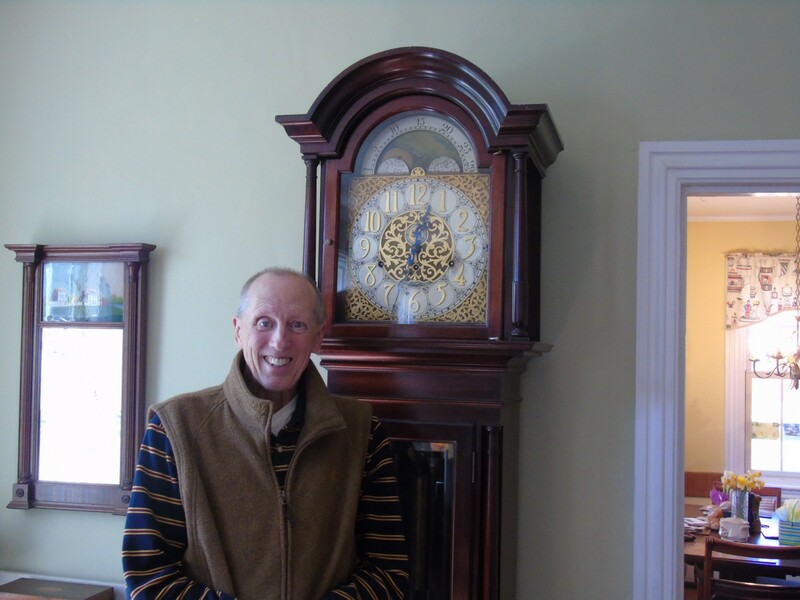 Brooks has a lot of art in his home, including paintings, sculptures, and this clock, which he enjoys. The difficulties of ALS presented themselves very quickly to Brooks, his wife, and his children. He is the first to admit that he doesn’t have the same life that he had not that long ago. Yet he looks at his life, both in the past and the present, with pride, love and satisfaction. When he shared his story with The ALS Association Greater Philadelphia Chapter, he did so with honesty and happiness for a life well lived and with so much to live for to this day. Throughout his life and career, J. Brooks Joyner has brought the beauty of the world to others. He won’t lie and say that ALS is beautiful, but, colored by a constantly evolving perspective, Brooks wants others to know that his life has been and continues to be beautiful. In fact, he wants others to see that all life has beauty and value. During his time at museums big and small, this visionary of the art world has always been at his happiest and proudest when somebody is opening their eyes to the universe in a new way for the first time. So today, in 2016, after over 40 years of studying and sharing art, Brooks wants others to see ALS in a new way. Just as with art, Brooks wants people to see that ALS is a terrible disease that impacts beautiful people of all walks of life. His goal in sharing his story is to encourage others to advocate, volunteer, donate, participate in a walk or bike ride, or do whatever their talent and ability will allow, not because ALS is bad, but because the lives it touches are good and amazing. Hopefully Brooks life story is interesting to you, as a reader. If you share your story with him, Brooks will certainly find it compelling. He wants to be a part of every network and universe of connections that he can touch. ALS may take his hands and his voice, but his eyes have seen too much love and goodnees to allow ALS to take his heart. Covering all the bases in the fight to defeat Lou Gehrig's Disease. Serving eastern Pennsylvania, southern New Jersey, and all of Delaware.